Visited the Hoverberg Caves yesterday, located at a mountain called Hoverberget in Jämtland (County). You need to climb the mountain for some distance before you can enter, but it is worth the effort. The cave was discovered in 1897. The tourist will be able to enter through a small opening and then you see what the first picture shows when you look up. Then you walk on stairs deeper and deeper and you will be able to to see 81 meters of it. 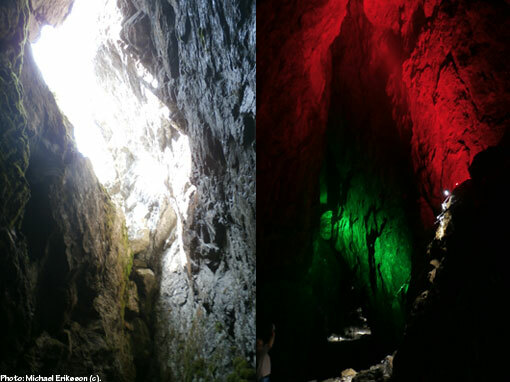 The hights are 20-30 meters at some places, highlighted by green and red lights. At the far end, there is a small opening that is closed for tourists, the caves have been explored almost another 90 meters. It is the largest cliff cave system in Sweden. Plenty to see around lake Storsjön (The Great Lake).